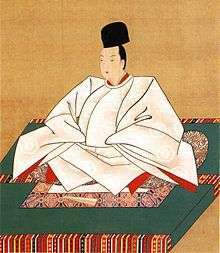 Emperor Nakamikado (中御門天皇, Nakamikado-tennō, January 14, 1702 – May 10, 1737) was the 114th emperor of Japan, according to the traditional order of succession. Nakamikado's reign spanned the years from 1709 through 1735. 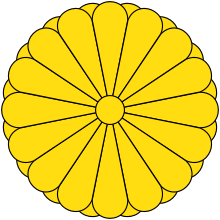 Before Nakamikado's ascension to the Chrysanthemum Throne, his personal name (imina) was Yoshihito (慶仁) or Yasuhito; and his pre-accession title was Masu-no-miya (長宮). Nakamikado was the fifth son of Emperor Higashiyama. His mother was the lady-in-waiting Fujiwara no Yoshiko, but he was brought up as if he were the son of the Empress consort, Arisugawa no Yukiko. In 1708, Nakamikado became Crown Prince. July 27, 1709 (Hōei 6, 21st day of the 6th month): Emperor Higashiyama abdicated and the throne passed to his son. January 16, 1710 (Hōei 6, 17th day of the 12th month): Higashiyama died. Immediately after the abdication, Prince Yashuhito became the emperor. Because of his youth, first his father, the retired Emperor Higashiyama, and then his grandfather, the retired Emperor Reigen exercised Imperial powers in his name. Nakamikado reign corresponded to the period from the sixth shōgun, Tokugawa Ienobu, to the eighth shōgun, Tokugawa Yoshimune. During this period, relations with the Bakufu were fairly good. Talk of a marriage between Imperial Princess Yaso-no-miya Yoshiko (八十宮吉子内親王), daughter of Retired Emperor Reigen and the seventh shōgun, Tokugawa Ietsugu were halted by the sudden death of the shogun in Edo. 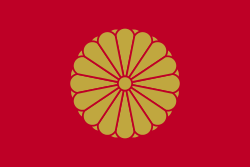 July 7, 1710 – March 22, 1711 (Hōei 7, 11th day of the 6th month – Shōtoku 1, 4th day of the 2nd month): A Ryukyuan diplomatic mission from Shō Eki of the Ryūkyū Kingdom was received by the shogunate. This was the largest delegation—168 people—in the Edo period. 1711 (Shōtoku 1): A Korean diplomatic mission from Sukjong of Joseon was received by the shogunate; and formal greetings were presented to mark the succession of Shogun Ienobu. November 12, 1712 (Shōtoku 2, 14th day of the 10th month): Shogun Tokugawa Ienobu died. 1713 (Shōtoku 3): Minamoto no Ietsugu became the 7th shogun of the Edo bakufu. 1714 (Shōtoku 4): The shogunate introduces new gold and silver coins into circulation. April 20, 1715 (Shōtoku 5, 17th day of the 3rd month): The 100th anniversary of the death of Tokugawa Ieyasu (posthumously known as Gongen-sama), which was celebrated throughout the empire. 1716 (Shōoku 6, 30th day of the 4th month): Shogun Ietsugu died of complications of a cold, at the age of six. 1717 (Kyōhō 2): Kyōhō reforms are directed and overseen by Shogun Yoshimune. 1718 (Kyōhō 3): The bakufu repaired the Imperial mausolea. 1718 (Kyōhō 6, 8th month): The bakufu established a petition-box (目安箱, meyasubako) at the office of the machi-bugyō in Heian-kyō. 1720 (Kyōhō 8): The chronological annals and the biographies which comprised the first completed portions of the Dai Nihonshi were presented to the bakufu. 1721 (Kyōhō 9): Edo population of 1.1 million is world's largest city. 1730 (Kyōhō 15): The Tokugawa shogunate officially recognizes the Dojima Rice Market in Osaka; and bakufu supervisors (nengyoji) are appointed to monitor the market and to collect taxes. The transactions relating to rice exchanges developed into securities exchanges, used primarily for transactions in public securities. The development of improved agriculture production caused the price of rice to fall in mid-Kyohō. August 3, 1730 (Kyōhō 15, 20th day of the 6th month): A fire broke out in Muromachi and 3,790 houses were burnt. Over 30,000 looms in Nishi-jin were destroyed. The bakufu distributed rice. 1732 (Kyōhō 17): The Kyōhō famine was the consequence after swarms of locusts devastated crops in agricultural communities around the inland sea. 1735: Nakamikado abdicated in favor of his son, but he continued to exercise Imperial powers in the same way his predecessors had done. 1736 (Genbun 1): The shogunate published an edict declaring that henceforth, the sole, authorized coinage in the empire would be those copper coins which were marked n the obverse with the character 文 (pronounced bun in Japanese or pronounced wen in Chinese—which is to say, the same character which is found in this era name of Genbun. 1737 (Genbun 2, 11th month): A comet is noticed in the western part of the sky. In 1737, Nakamikado died. His kami is enshrined in an Imperial mausoleum (misasagi), Tsuki no wa no misasagi, at Sennyū-ji in Higashiyama-ku, Kyoto. Also enshrined in this location are his immediate Imperial predecessors since Emperor Go-Mizunoo – Meishō, Go-Kōmyō, Go-Sai, Reigen, and Higashiyama. Nakamikado's immediate Imperial successors, including Sakuramachi, Momozono, Go-Sakuramachi and Go-Momozono, are enshrined here as well. The years of Nakamikado's reign are more specifically identified by more than one era name or nengō. 1 2 3 4 5 Ponsonby-Fane, Richard. (1959). The Imperial House of Japan, p. 118. 1 2 Titsingh, Issac. (1834). Annales des empereurs du japon, pp. 416–417. ↑ Meyer, Eva-Maria. (1999). Japans Kaiserhof in der Edo-Zeit, pp. 45–46. 1 2 3 4 5 Titsingh, p. 416; Meyer, p. 46. ↑ Titsingh, p. 415; Ponsonby-Fane, p. 118. ↑ Northeast Asia History Foundation: Korea-Japan relations citing Dongsarok by Jo Tae-eok et al. ↑ Screech, Timon. (2006). Secret Memoirs of the Shoguns, p. 98. ↑ Bowman, John Stewart. (2000). Columbia Chronologies of Asian History and Culture, p. 142. 1 2 3 Ponsonby-Fane, Richard. (1956). Kyoto: the Old Capital, 794–1869, p. 320. ↑ Brownlee, John S. (1999). Japanese Historians and the National Myths, p. 29. ↑ Foreign Press Center. (1997). Japan: Eyes on the Country, Views of the 47 Prefectures, p. 127. ↑ Adams, Thomas. (1953). Japanese Securities Markets: A Historical Survey, p. 11. ↑ Hayami, Akira et al. (2004) The Economic History of Japan: 1600–1990, p. 67. ↑ Hall, John. (1988). The Cambridge History of Japan, p. 456. 1 2 Titsingh, p. 417. 1 2 Titsingh, p. 418.